International competition calling for ideas for the Vltava riverbank in Prague. Skanska: Bridging Prague Award is a challenge for interdisciplinary collaboration on new conceptions to connect the river with the historical capital city. Prague, March 20, 2012 – A new international idea competition is announced by reSITE Festival, ARCHIP (Architectural Institute in Prague) and Skanska, to find new conceptions and proposals for the River Vltava, in Prague, Czech Republic. The scope of the competition is the Vltava riverbank and its immediate context from Libensky Most (Bridge) to the north to Zeleznicni most (Railway Bridge) to the south. This section of the river has really various character and quality on both riverbanks, which gives competitors a chance to select and work on a wide scope of places and areas. 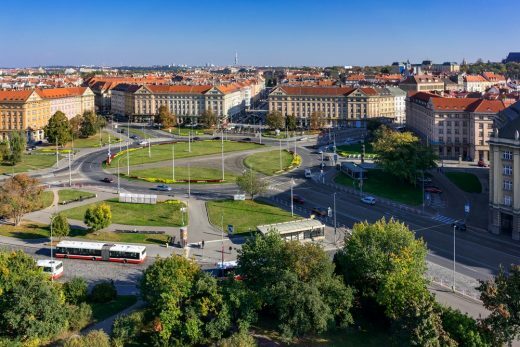 The proposals should use existing potential of the Vltava river, define its connection with the city – and lead to creation of attractive public spaces of adequate scale, living by variety of activities. The international competition in anonymous and open to all interested parties, regardless of age or profession. An entry can be submitted by an individual, a company, or a team. The projects will be judged in two rounds, the winners will be chosen by an international jury, composed of renowned professionals like Kate Orff, Alexandros Washburn, Jakub Cigler, Adam Gebrian, Igor Kovačević or Jan Skalický. Competition regulations and complete brief plus material are available at www.resite.cz/competition. Registration is free of charge. Entries in English language are to be sent only in digital form – the deadline is Monday, May14, 2012. The Skanska: Bridging Prague Award is a part of the inaugural reSITE Festival, an international event taking place in Prague in May 21–27. Its committed to interdisciplinary design collaboration to make cities more livable. The Festival will be centered on a two-day conference and supported by dozens of independently organized events. The spotlight of reSITE is the future of Vltava riverfront and the whole city of Prague, urban mobility and public spaces. reSITE is being organized by an American landscape architect Martin Barry, Fulbright Scholar and Visiting Professor at FA CTU, Partnership Foundation and Architectural Institute in Prague, an international private college. The competition focuses on creating a new, contemporary conception for the Dukla sports complex, a sporting area with one of the greatest potentials in the Czech Republic, and its immediate surroundings. The district of Prague 7 has declared an international architectural competition for a design for its new town hall. For this purpose, we intend to reconstruct the extant building at the address U Průhonu 38, where – with the aid of the architects – we hope to offer our citizens the best possible built environment for addressing everyday administrative matters. March 21, 2012 in Competitions.